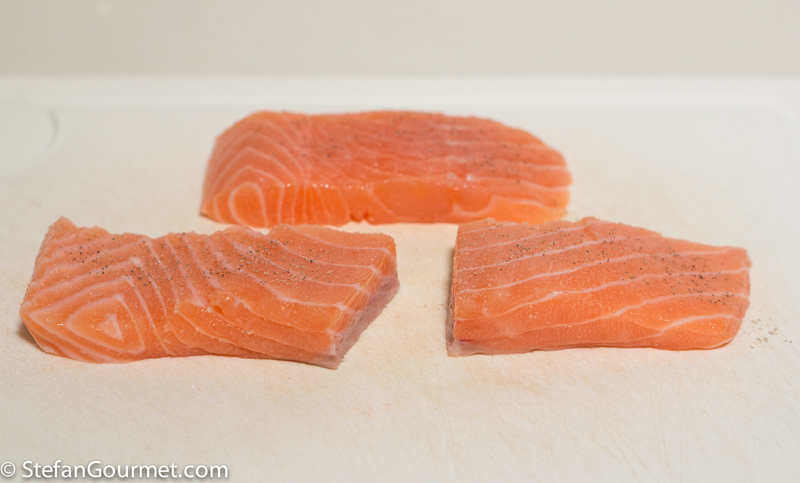 To compensate for the fanciness of the previous post featuring white truffle, this post is back to basics: how to pan fry salmon. Or salmon fillet, to be more precise. 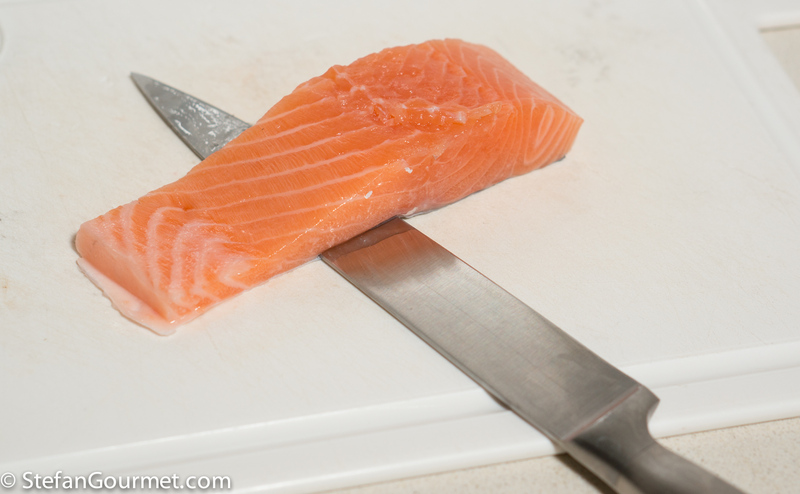 There are two common problems with cooking salmon fillet, caused by the fact that it is a lot thicker on one end compared to the other end. This leads to uneven cooking and uneven seasoning, and the inside of the thick side can taste boring because it lacks a crust and saltiness. Uneven cooking leads to either overcooking the thin part or undercooking the thick part. If it comes with skin, you can decide to leave it on or take it off. To remove the skin, cut between the skin and the flesh with a very sharp knife, then hold the piece of skin with your fingers and pull on it to keep it tight, while you continue to slice off the skin. …so you end up with two pieces that have approximately the same thickness. You will also get one small piece and one large piece. For easier flipping I cut the large piece in half. This way, you will end up with three pieces of salmon that are roughly equal in size. Season them with salt, and, if you like, freshly ground black pepper on both sides. An additional advantage of this method, is that it reduces the cooking time. 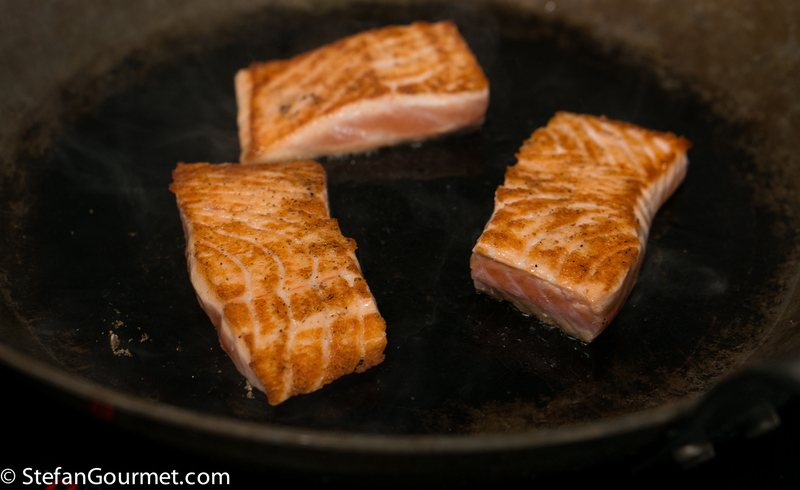 If you use a good non stick pan, you only need to drizzle a bit of oil on the salmon and rub the salmon with it. This way, the end result will be less greasy. 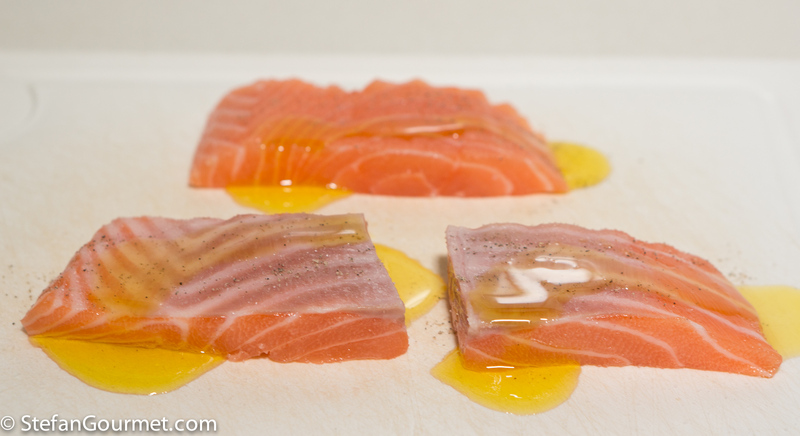 (Most of the oil shown here on the photo actually remains on the cutting board.) I use olive oil, but other vegetable oil such as sunflower, canola, soybean, peanut, or corn can also be used. 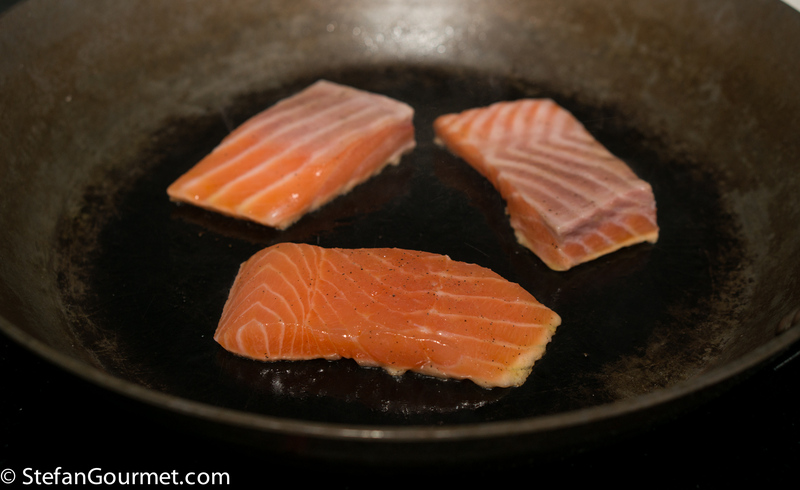 Now heat up a non stick frying pan until it is hot before adding the salmon. My favorite type of non stick frying pan is made of carbon steel. If you season it properly, its non stick qualities are as good as that of non stick pans with a coating, but they are much more durable. This is better for the environment, cheaper in the end, and better for your health. The coating will always deteriorate after a while (and you could end up ingesting pieces of coating), even if you use it carefully. If a carbon steel pan loses its non stick qualities, you can clean it by heating it with salt in it, and then re-season it by heating it with oil in it. …then turn it with a spatula and cook it on the other side until that is golden brown as well, 1 to 2 minutes. 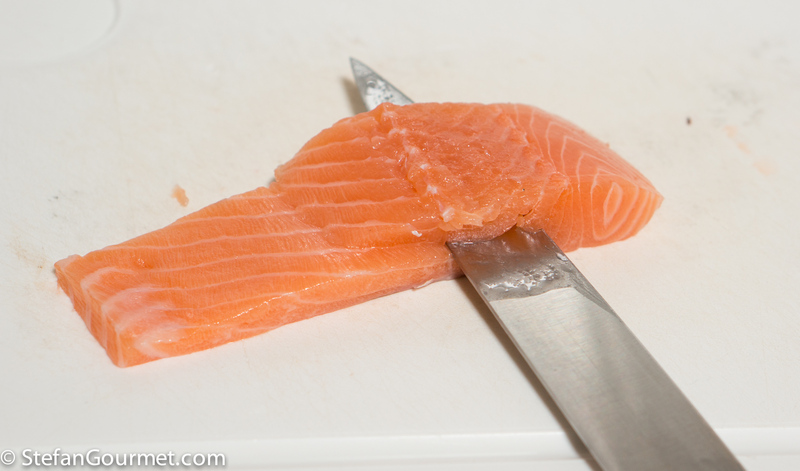 The salmon is not completely cooked through yet, and that is how it is supposed to be. 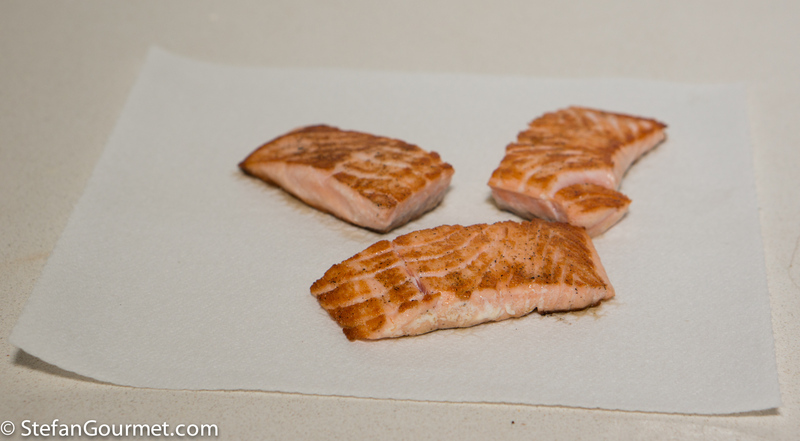 Lift the salmon out of the pan with a spatula, and arrange it on kitchen paper to drain any excess oil. Cover with more kitchen paper, and press lightly to absorb excess oil from the top. The carry-over heat will finish cooking the inside of the salmon between the time you take it out of the pan and the time you start eating it. 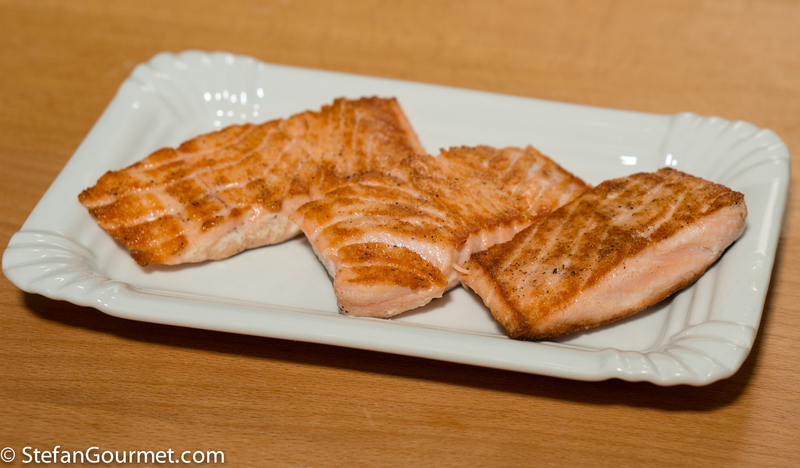 If all went well, your salmon will now be crispy on the outside and just cooked through and juicy on the inside. 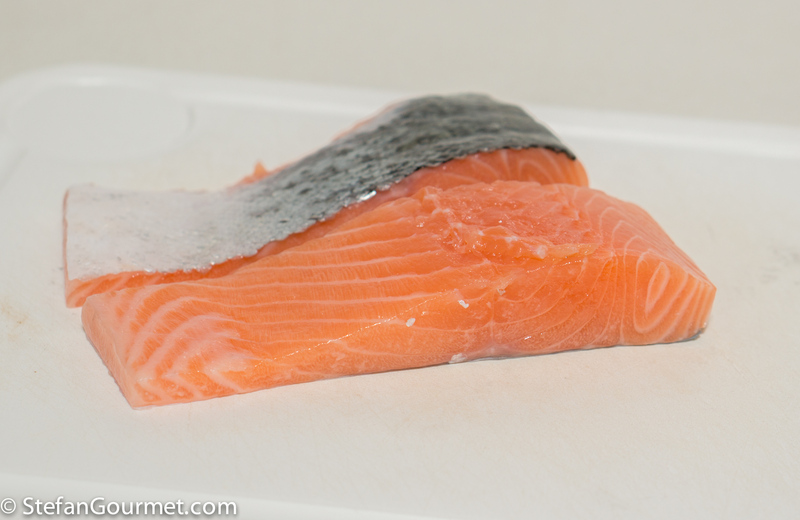 Cook salmon fillets often, always leaving the skin on. Have never used the three-piece method tho’ it does make sense. Visually I kind’of do like the fillet in one piece I must admit . . . the size of fillets I buy, it is usually about a good two minutes on the first side, one the second and rest . . . . shall try yours next time I get a big enough piece . . . It is simple foods that so difficult to get right – salmon and chicken are two perfect examples for this. Great advice, Stefan – I never thought of cutting the filet in half to ensure even cooking – now I know. Live and learn! Ma dai, sono sicuro che tu sei in grado di preparare il salmone in padella.